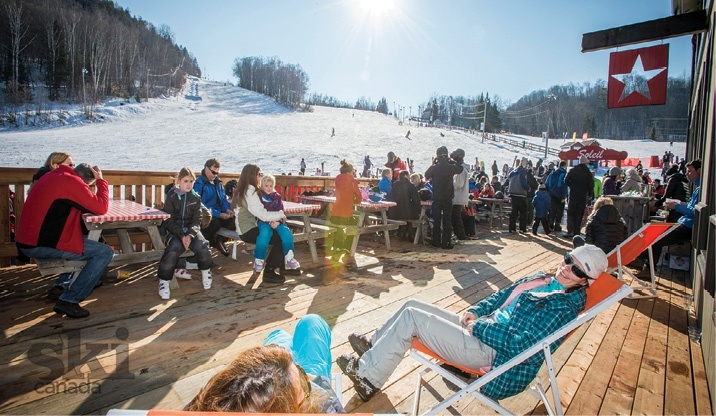 Canada’s densest concentration of ski hills—and skier-friendly pit stops—lines the Laurentian Autoroute between Montreal and Mont Tremblant. The record-setting extent of Sauveur’s nightskiing hits home as I stand at the top of the L’Atomic Express high-speed quad. Radiating outward like the spokes of a massive whitewashed wagon wheel, the six wonderfully groomed runs below me might account for the full extent of evening descents at many much larger ski areas. 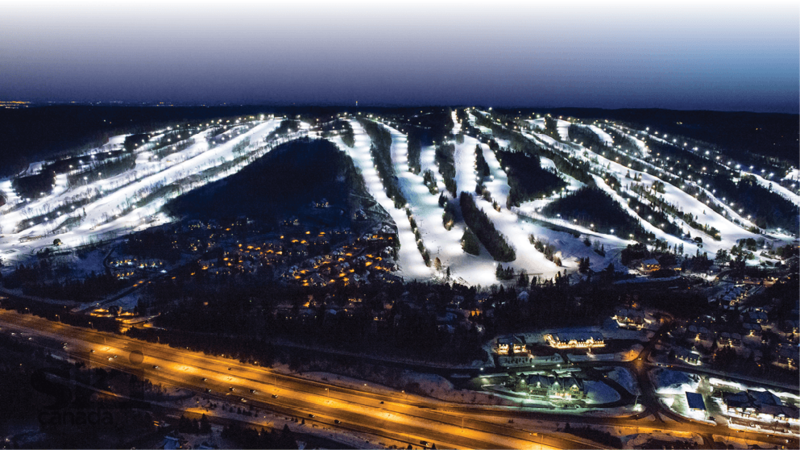 At Sauveur, however, more than 70 per cent of the 40 trails are illuminated, yielding 48 hectares of floodlit terrain—reputed to be the most extensive on Earth. The Gabriel exit appears so soon after passing Sauveur that I have to swerve to make it. 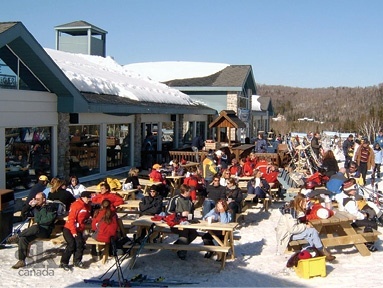 Directly across the valley from the similarly sized Sommet Olympia, Gabriel is another member of the five-resort Les Sommets group that includes the nearby Sommet Morin Heights and Sommet Edelweiss north of Ottawa. Speaking of swerving, there’s plenty of that going on all over the 21-run hill. For one thing, Gabriel is known for its moguls, having hosted the FIS Freestyle World Cup 10 times since 1990. 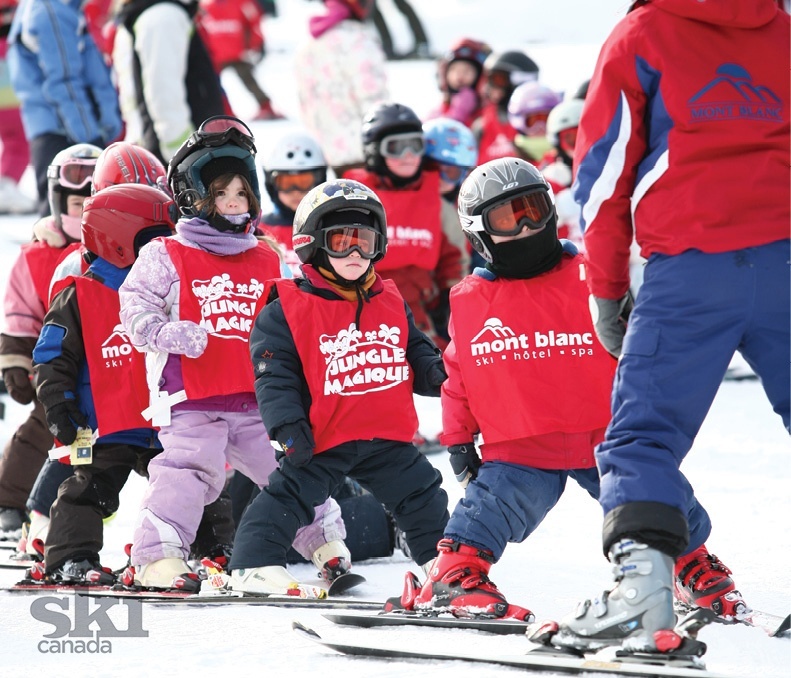 For another, Montrealers’ love of nightskiing is on full display, as is their love of skiing very fast. Good thing Gabriel’s two quad chairs both climb wide and superbly groomed black-diamond descents that provide plenty of elbow room for Mikaël Kingsbury wannabes. Why would a ski hill be named after a breed of chicken? The question intrigues me as I ride one of Chantecler’s two quad chairs toward the luminous summit. With a gibbous moon overhead and the floodlights blazing away, I can clearly make out the frozen outline of Lac Rond just beyond the bottom of the lift. It looks a bit like an egg, so…maybe that’s the reason? I glide down the soft-packed corduroy of the intermediate Marie-Pier Préfontaine run, which is named after the former national ski team member from the nearby town of Sainte-Adèle. Could it be that Adèle was the patron saint of poultry? Then I notice the enormous Ski Chantecler billboard a third of the way down the hill and can almost hear the rooster logo crowing. Trust me on this, but nothing relieves the stress of a December road trip like carving a turn. And with my wife and two daughters joining me on this rare drive from Ottawa to Tremblant, an afternoon stop at Mont Blanc is exactly what the family needs. Like Tremblant, its taller neighbour, the northern terminus of the Corduroy Highway does not offer nightskiing. What it does offer, however, is more vertical than any other hill along the autoroute, and the second most in the region after Tremblant. And I like the math. This means more turns per lap, and with seven chairs on hand the laps come fast and furious. As the afternoon sun hits my early-Christmas-gift goggles, I feel the holiday chaos fading away. The kids, of course, are all about chaos, and that’s where the Jungle Magique comes in. The tubes, slides, ball pits, zipline and mazes of the four-storey indoor play park keep them entertained for hours, while ma femme, Angela, and I chase away any lingering road rage on Sauvignon and Chardonnay, two of Mont Blanc’s 43 trails and the most aptly named runs in the history of parenting.